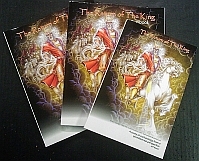 The Return of the King Teacher and Student manuals have been released as teaching aids for The Return of the King book (ISBN: 1441468544) by author Jeff Kluttz of ReturningKing.com. The Return of the King (ROTK) book is a biblical study of the timeline of eschatology from a premillennial perspective. It is written to a non-technical audience, with all theological terms explained as they appear in the work. With the ROTK main book as a source material, teachers are now able to use the workbook series to lead a classroom presentation of the material. While the Teacher’s and Student’s Workbooks do not contain the depth of information the ROTK book contains, they are more than mere outlines. The workbooks are designed in such a way that a student of the course can return to the workbook at a later time to reinforce the subject matter of the course. As such, there is much manuscripting within the outline of the workbooks to allow students to thoroughly review the materials long after the course has completed. The Student and Teacher Workbooks are condensed versions of the original ROTK book, and are not sufficient for the course study by one who has not first studied the main book. As such, the workbooks are not designed for self-study. One should obtain the original ROTK book for such purposes. Yet, coupled with a teacher who has read and assimilated the material from ROTK, the Teacher’s Workbook is designed to lead a self-paced group study through the identical outline and subject matter of the original. Identical to the Teacher’s Workbook, the Student’s Workbook contains fill-in-the-blank completion of key terms throughout the study. All three books are now available from the author’s page at Amazon.com. More information is available at the website. Discounts can also be obtained for use at the Author’s e-store for student books in quantities over 10 units. Discount codes must be obtained directly from the www.ReturningKing.com. A contact form is on the bottom of any page.